The looming affordable housing crisis will likely be the biggest issue facing our cities in 2014. A convergence of cataclysmic real estate prices, a development slowdown, and a weak job market are squeezing low-income residents out of urban areas. But all is not dire: I found seven new projects that are bright spots in the U.S.'s affordable housing future. In the past year I've written two stories for the Los Angeles Times highlighting two trends spurring this new age of affordable housing: One is the growing popularity of microunits and high-rise developments that help densify and diversify neighborhoods, and another is the rise of affordable housing nonprofits, like Santa Monica-based Community Corporation, that are providing viable options for residents to stay in neighborhoods where rents are skyrocketing. These developments can't come quickly enough: It's estimated that, for every 100 low-income renter household in the U.S., there are only 30 affordable and available units. Still, affordable housing has its detractors. Problems with safety and maintenance in older public housing projects have given affordable housing a stigma which means some communities are not as welcoming of these developments. A recent study determined that living in micro-units (especially ones that are overcrowded) can be detrimental to physical and mental health. And sometimes what's deemed "affordable" housing is actually not all that financially accessible for much of the population that really needs it. But the typology is being reinvented in positive ways, like this light-filled project in Queens that will be New York City's biggest affordable housing development since the 1960s. As these projects show, when developers tap great local designers to work on solutions that are appropriate to both the neighborhood and the needs of residents, it results in new housing stock that truly serves the city. But it's the combination of great architecture and innovative public-private partnerships which offer social services and also help manage the buildings long-term that is the key to creating affordable communities. This 33-unit complex takes design cues from the ubiquitous 1960s-era dingbat apartments that dot the beachside city to help it blend in to the existing built environment. Architect Kevin Daly wanted residents to feel a sense of community and openness without sacrificing privacy, so he lined a series of inner walkways with vertical slats of wood that act as permeable screens, allowing just enough light, movement and sound to infiltrate the courtyard. On the rear of the property is a Boys and Girls Club which provides after-school activities for local children. An $18 million development in the Ocean Hill neighborhood of Brooklyn is part of Mayor Bloomberg's New Housing Marketplace Plan to build or preserve 165,000 units of affordable housing by June 2014. The housing stock was offered by lottery to local low-income residents. These 65 units feature large glass sunrooms which not only bring light into the spaces, but also serve as a way for residents to feel safer by keeping an eye on what's happening on the street. 50 units priced for "workforce housing" for residents who meet a certain income requirement were built adjacent to a light rail station using the city's Transit Oriented-Development Fund, which helps acquire land near transit for affordable housing. Although the building looks like the century-old brick warehouses which are found in the area, it's a brand-new construction that doesn't look out of place in the landscape. The ground floor has 10,000 of commercial space, including a community-focused dance studio. A pair of 1912 hotels in downtown Oakland were transformed into transitional housing for recently homeless and very low income residents by Satellite Affordable Housing Associates and the city of Oakland. After merging the two century-old hotels into one complex, the former SRO rooms were converted into 101 studio apartments that preserve the architectural history of the buildings but offer contemporary conveniences. On the ground level are commercial businesses, a computer lab, and community rooms for public meetings, and the building is transit-accessible with a BART station only a block away. Nearing completion in downtown Los Angeles, the Star Apartments demonstrate one of the most important innovations in affordable housing: Using prefabricated units to cut down on construction costs and development time. 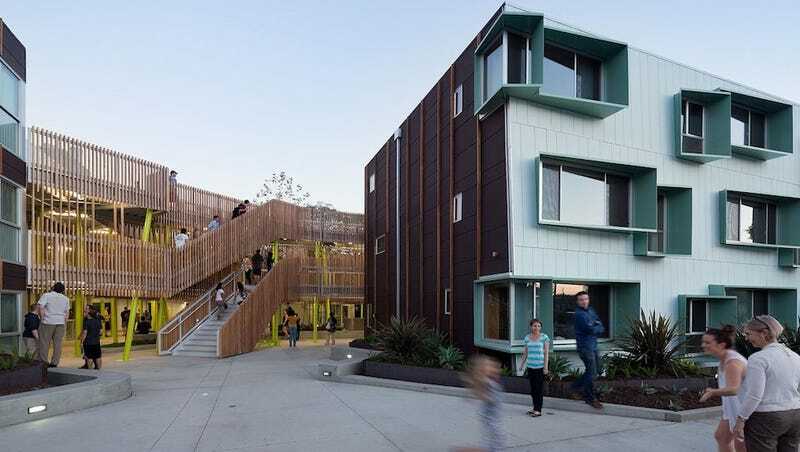 The six-story structure developed by the Skid Row Housing Trust will serve as transitional housing for residents of the area, which has a high concentration of social services. The ground floor will offer retail and the second story will be focused on public areas and meeting rooms for residents. This 89-unit supportive housing project is part of Mayor Emanuel's Neighborhoods Now initiative that brings coordinated development to seven areas around the city. Hidden in this gorgeous 1930 Art Deco facade are state-of-the-art features like a green roof and solar panels which were tucked away to preserve the architectural integrity of the structure. The urban farm onsite includes beekeeping facilities and a chicken coop, and the produce will be served as a planned ground floor cafe. A nutritionist and gardener are also on staff to help serve residents. Located in the Morrisania neighborhood of the Bronx, the Arbor House lives up to its name with a hydroponic farm on its roof that can grow enough vegetables for 450 people annually. The 124 units are similarly green-focused, with a focus on reclaimed and recycled materials, energy-efficient appliances, and a living wall in the lobby. The building is also designed to encourage stair use and physical movement in accordance with the city's Active Design guidelines.